By focusing on simplicity and ease of use, Breathe is a cloud HR software solution designed to tame the chaos so that you can get out from behind the desk and lead your people. Transform how you manage HR admin — centralise your information with one HR system. 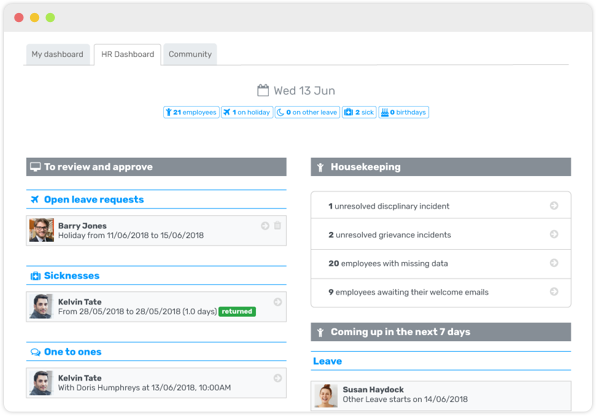 Keeping all your employee information in one place and automating all those time consuming human resource administrative tasks, Breathe transforms the way you manage your HR. 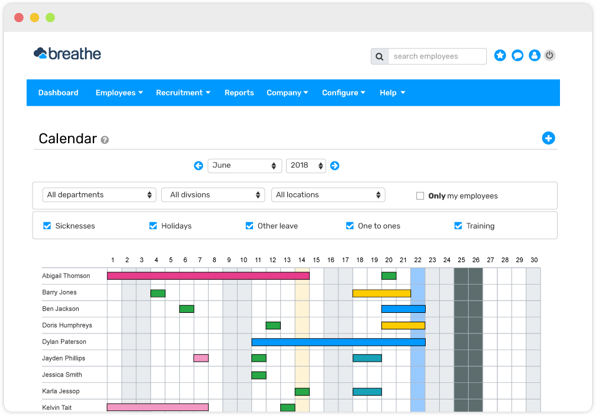 With customisable reports, automated and streamlined processes, this HR management system gives you the tools you need to support your business. With nothing to install and a step-by-step setup, getting started with our cloud based HR software is easy. You’ll get immediate access to the complete system and do not have to enter in payment details until you are ready. Go active before your trial is over? You’ll still get the 14 days for free. Data security is our number one priority. Our HR software uses HTTPS encryption to ensure data is always encrypted as it travels from our highly secure EU data centres to your browser. Read more about our security and reliability. Getting ready for GDPR? Download our GDPR guide to see how Breathe can help you. Have a question? We are here for you if you need a little extra help. Whether it's our knowledge base, videos, a quick email or a phone call, we want to help you and your team get the most from your system and answer your questions. And it's free! The go anywhere HR management system. Responsive design. Simple to use. With your information in the cloud, Breathe has created a seamless design that looks beautiful on any device to help you get the job done– no matter where you are. HRM software does not have to be complicated or confusing. With absolutely nothing to install and a simple setup process, Breathe is your online HR manager. If you're looking for a new HR system, our webinar is perfect for you. We'll give you a tour of Breathe's key features and demonstrate how it can benefit your business.